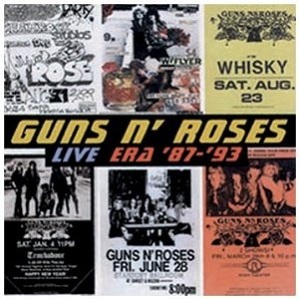 Guns N Roses Live Era 87–93 is a live compilation by heavy metal metal Guns n Roses. It’s believed that most of the recordings came from the tours to promote the Use Your Illusion studio albums. Here is a video of Sweet Child Of Mine performed live from 1992. And Paradise City from 1988. This entry was posted in 1980s Live Albums, 1990s Live Albums, Heavy Metal Live Albums, Live Album Compilations and tagged 1980s hard rock, 1990s hard rock, Guns n Roses Live Albums by Paul Simister. Bookmark the permalink.